As part of an overhaul of training package development, expressions of interest are being invited to apply for funding to operate as skills service organisations. The Australian Government is introducing this new model of training product development to ensure that training standards are based on the skills needed for real jobs in the Australian workplace of both today and tomorrow. It will also ensure resources are allocated to develop and renew training products based on in-depth analysis of Australia’s workforce skills demands and industry needs. The new model will support Industry Reference Committees (IRCs) to guide the development of industry-based training products including training packages and support materials. IRCs will be convened as required in response to industry identified needs and government priority and their membership will have the demonstrated experience, skills and knowledge to represent the issues of their sector. From 1 January 2016, skills service organisations will be independent bodies funded by the Australian Government to support IRCs to review and develop training products for the vocational education and training system. Assistant Minister for Education and Training, Senator the Hon Simon Birmingham, said that skills service organisations will play a crucial supporting role in ensuring that training delivers the competencies that jobs will require in the future. Arrangements have been put in place to ensure a smooth transition from current Industry Skills Councils to skills service organisations. The new Australian Industry Skills Committee, chaired by Mr John Pollaers, will be responsible for scheduling and commissioning skills service organisations to undertake work based on the advice of industry reference committees. The Committee will work closely with industry leaders and workplace representatives across all sectors to ensure Australian industry has access to a highly skilled workforce. Online Expression of Interest applications opened on 27 July 2015 and can be lodged until 24 August 2015. The Department of Education and Training will conduct a number of information sessions for potential applicants. Read more. Assistant Minister for Education and Training, Senator Simon Birmingham, recently visited China and Korea to advance Australia’s strong international education ties with both countries. More than 35,000 people enrolled with Australian vocational education and training (VET) providers in China in 2013, representing 72 per cent of total offshore enrolment numbers. In 2014, education-related travel services to South Korea generated more than $759 million in trade. Senator Birmingham said Australian vocational education and training providers are helping countries in our region to upskill their workforces both onshore and overseas, creating mutual benefits in terms of economic growth, labour mobility and relationships between Australia and the region. Australia’s recent signing of free-trade-agreements with China and South Korea has further opened up opportunities for even stronger ties between these economies, including in high quality education and training services. By engaging internationally with countries such as China and South Korea, Australia’s all-important VET sector, which produces high quality industry relevant expertise, will help ensure its training systems continue to deliver the skills for global business in Australia and throughout the world. Read more about Senator Birmingham’s visit. International education is Australia’s largest services export and drives at least 130,000 full-time equivalent jobs nationally. It is estimated that one job is created in Australia for every two international students who study here. By 2030 the global labour force is predicted to grow to around 3.5 billion and there is growing demand for intermediate and technical levels skills, which Australia is well placed to support. The Draft National Strategy for International Education, released in April 2015, outlines a vision that places international education at the core of Australia’s economic prosperity, social advancement and international standing. The Coordinating Council for International Education has been established to oversee the finalisation of this national strategy and the development of an implementation plan to reflect a shared national vision and responsibility. Since the draft’s release the Australian Government has been consulting with education providers, businesses, students, governments and community groups. The Australian international education community has been encouraged to provide feedback and examples of specific institutional, state and territory, and community-based initiatives that further the proposed goals. The first of two roundtables on international education was held in June and brought together around 100 participants to work on a shared vision for the future of Australian international education. As part of the consultation process, a second roundtable will be held this month. Minister Birmingham held two VET focused Global Skills Training forums in Melbourne and Sydney. The forums are a great way for the Minister to hear feedback from industry and the VET sector on the role of skills training in the Draft Strategy and to discuss new ways Australia can meet the significant opportunity presented by changing demographics in the Asia Pacific region and the demand for higher order skills. It is anticipated that the final strategy will be released in the second half of 2015. Read the Draft National Strategy for International Education. A new project mapping transport and logistic skills needs and competencies in the Asia-Pacific region will boost global labour mobility, regional economic development and opportunities for Australian training providers to operate overseas. Assistant Minister for Education and Training, Senator Simon Birmingham, announced the APEC Transport and Logistics project at the second Global Skills Training Forum held recently in Sydney. Under the APEC Economic Diplomacy Fund, the Australian Government will provide $259,000 towards the project to develop regional occupational standards validated by industry representatives from the transport and logistics sector in Australia, China, Indonesia, the Philippines and Vietnam. The project will provide businesses operating within and across these economies with greater understanding and certainty of the core skills required and held by workers in transport and logistics. Lifting the standards of skills training across the region will make it easier for highly trained workers to receive mutual recognition in other countries and will address skills shortages, and boost competitiveness and productivity in regional economies including Australia. Senator Birmingham told the Global Skills Forum there were already more than 200 registered Australian training providers able to deliver over 2400 vocational education and training courses offshore. This project will also provide opportunities for Australian providers to deliver high quality, industry-relevant training to more students overseas. Assistant Minister for Education and Training, Senator the Hon Simon Birmingham, recently launched the latest round of enhancements to the MySkills website. The MySkills website is the national directory of vocational education and training (VET) organisations and courses. This latest update continues to improve and evolve the website into a sophisticated and useful tool for students, training organisations and employers. • a modernised, tablet-optimised homepage design. With over one million visits in the past year, MySkills website has established itself as a reliable source of information for training consumers and provides advice on the skills people need to secure and maintain work. The Australian Government’s Australian Apprenticeship Support Network (Apprenticeship Network) is investing $200 million a year to recruit, train and retrain apprentices. Across the country, there are more than 420 Apprenticeship Network locations, including more than 270 Network provider sites and over 140 further locations for outreach services. Assistant Minister for Education and Training, Senator the Hon Simon Birmingham, launched ‘The MAS Experience’, MAS National’s Apprenticeship Network, in Adelaide on 24 July 2015. MAS National is providing support through 52 full time, part-time and outreach locations across South Australia, Victoria and Tasmania. South Australia previously hosted 24 Australian Apprenticeship Centres, but as part of the new arrangements, will now host 35 locations, including 22 Network sites and 13 outreach services. MAS National is one of 11 organisations contracted by the Australian Government to deliver the new Apprenticeship Network which makes it easier to become, or employ, an apprentice. Apprenticeship Network providers target support services to the individual needs of employers and apprentices from pre-commencement to completion, assisting apprentices, people looking for a new career and employers get more help than ever before with their apprenticeship. 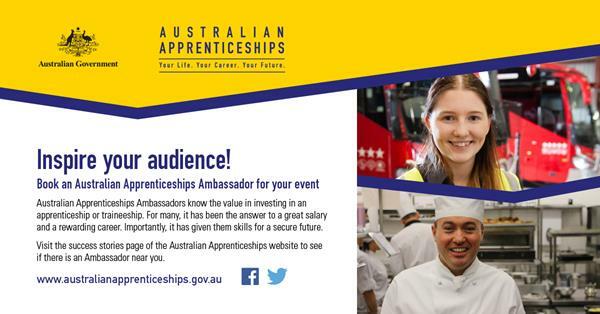 Visit the Australian Apprenticeships website or call the referral line on 13 38 73 for more information. The journey begins for the next generation of apprentices, trainees and students aged 18-23 years with the commencement of the 2015 WorldSkills Australia Regional Competitions. Held in 31 regions across the country, competitors are marked against a rigorous framework aligned to national training packages, standards and benchmarks. There are 52 competition skills on offer from the Automotive Services, Building & Construction, Computing & Business, Client Services, Hospitality Services and Metal & Engineering industries. WorldSkills Australia Regional Competitions are more than just a chance to shine – they are the starting point for the journey of a lifetime. Regional level medallists may be selected to progress to the 2016 WorldSkills Australia National Competition, the nation’s largest trades and skills showcase. Age eligible national medallists may then be offered a place on the Skills Squad. Here, they will undertake months of intensive training and mentorship with their personal Training Manager in the hope of representing Australia as a 2017 Skillaroo at the 44th WorldSkills Competition in Abu Dhabi, UAE. WorldSkills Australia Regional Competitions are running until 31 October 2015. For more information, visit the WorldSkills Australia website. This month, the 2015 Skillaroos are in São Paulo, Brazil, competing for the coveted title of World Champion at the 43rd WorldSkills Competition. Senator the Hon Scott Ryan, Parliamentary Secretary to the Minister for Education and Training, farewelled the 26 Skillaroos at a function in Sydney this week. Read Senator Ryan’s speech. Competition results will be announced on Monday 17 August. To keep up-to-date with the latest news from São Paulo, visit the WorldSkills website. Every day 10 tradies are badly injured at work. That's 3650 tradies a year on workers’ compensation. Nearly a quarter of all roofers, labourers and plumbers experience back pain, muscle stress and strain from lifting equipment or slips, trips and falls when handling materials. And, 94 per cent of tradies reported that they don't eat enough fruit and/or vegetables. The Australian Physiotherapy Association (APA) has created Tradies National Health Month to help provide valuable information for tradies on the importance of full body health and safety. The APA’s 2014 Stop Trading Your Health Away report showed that Tradie occupations have among the highest number of injuries, musculoskeletal conditions and other health and safety risks of any profession. The APA felt that there was no dedicated support centre for tradies, therefore creating a month that focuses on trade full-body health and safety to improve their awareness and well-being. Throughout August 2015, the APA will promote health and safety tips and encourage tradies and trade companies to register to be a part of the Tradies National Health Month by holding Tradies Health events in their local jurisdiction. Visit the Tradies National Health Month website to share tradie health and safety tips or to participate in a Tradies National Health Month event. You can also be part of the movement by following the hashtags #tradieshealth and #dontignorethepain on Facebook and Twitter. The Assistant Minister for Education and Training, Senator the Hon Simon Birmingham, will be the keynote speaker at the official launch of National Skills Week in Sydney on 24 August 2015. Now in its fifth year, National Skills Week is dedicated to raising the status of vocational education and training (VET). This year’s theme will embrace and bring into focus the skills needs associated with Australia’s emerging areas of opportunity. The week celebrates and reflects on how important VET is to our nation and the lives of individual Australians by highlighting the talents, skills, career pathways and value of apprentices and trainees to the wider public and employers. Visit the National Skills Week website to read Senator Birmingham’s message and to see the full listing of events. 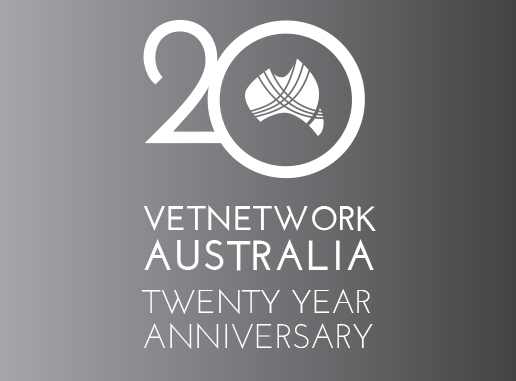 VETnetwork Australia is celebrating their 20 year anniversary in 2015 by hosting a full day workshop and dinner in Canberra on Thursday, 17 September 2015. The workshop will focus on the achievements of Vocational Education and Training (VET) for young Australians and VET practitioners, including discussion and reflection on pedagogy, professionalism, practice and process. Confirmed speakers include Ms Jodi Schmidt, CEO of TAFE Queensland, with an overview of the need to ‘professionalise the VET professional’ and Ms Kira Clarke, Lecturer in Education Policy, Melbourne Graduate School of Education, who will speak on her recent research on vocational education for young people and VET delivered to secondary students. A panel session facilitated by Mr Mark Callaghan, CEO of WorldSkills Australia, will showcase the winning Skillaroos from the 43rd International WorldSkills Competition being held in August in São Paulo, Brazil. 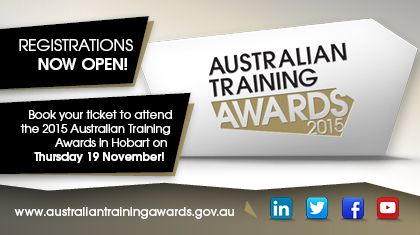 Please join the Australian vocational education and training sector on 19 November 2015 in Hobart for the 2015 Australian Training Awards. Hosted by Senator the Hon Simon Birmingham, Assistant Minister for Education and Training, the Awards recognise individuals, businesses and registered training organisations for their significant contribution to skilling Australia. Please register here to attend the event. The majority of the Australian Training Awards are the culmination of state and territory competitions, with training award winners from each state and territory eligible to compete in aligned categories at the national level. There are seven award categories that are available by entering the Australian Training Awards directly. Entries for 2015 state and territory training awards have now closed, with finalists being announced over the coming months. Visit the state and territory training awards for finalist announcements and event dates. Direct entry category finalists of the Australian Training Awards will be announced in late August. The CPSISC Newsletter for April - June 2015 is available here now! 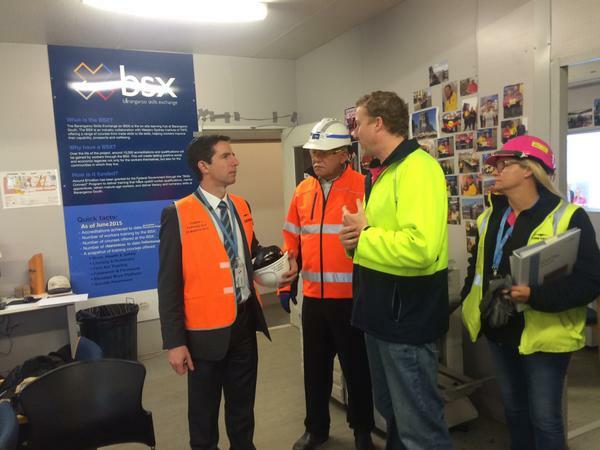 Senator the Hon Simon Birmingham, Assistant Minister for Education and Training, recently visited apprentices and workers on-site at Sydney’s largest re-development project, Barangaroo. Construction and Property Services Industry Skills Council (CPSISC), Lend Lease and TAFE NSW partnered together with the then Commonwealth Department of Industry, now the Department of Education and Training, in 2012 to create this unprecedented opportunity to develop an even more skilled and employable workforce in the Australian construction industry. The BSX is an on-site hub for all workers to learn new skills, develop existing ones, and improve their employment prospects further down the line. It offers a one stop learning shop in a range of areas including literacy, numeracy, IT, construction skills and leadership. The current workforce at Barangaroo exceeds 3,000 people per day, and to date over 19,000 training outcomes have been delivered at the BSX. With over 500 apprentices already engaged and a further 1200 expected to be able to complete their apprenticeships and traineeships over the course of the current project, Barangaroo will become the single largest trainer of construction industry apprentices in Australian history. The BSX model is at the forefront of infrastructure projects and will be replicated in the future. Read CPSISC’s Media Release. Across the globe, employers face challenges finding suitably skilled workforces to enable the level of production necessary for a prosperous economy. Simultaneously, communities face high unemployment when major local industries experience downturns. Regional communities form the backbone of Industry and are a key contributor to prosperous economic conditions. As employment conditions change, it is critical to maintain that finely tuned ecosystem in which Industry and communities co-exist. Industry provides jobs and economic stability; communities provide capable workforces and support. Read more on the SkillsDMC website. In the resources and infrastructure industry, being ahead of the trend can make all the difference. SkillsDMC has just released an update to the 2015 Environmental Scan (E-Scan), ensuring industry has access to high quality, accurate forecasting information. The 2015 E-Scan was met with widespread support by industry and government alike. Providing reasoned forecasts and analysis, both the 2015 E-Scan and update provide robust insights into the current resources and infrastructure industry workforce environment in Australia. The update highlights that despite some recent negative sentiment towards the outlook for industry, the mining industry continues to perform to expectations while employment trends show both positive and challenging developments. Access the updated E-Scan to read more. IBSA is adding new products to the store every week! You can check out the full range of delivery and assessment materials on the IBSA store page and read more about our elearning modules. 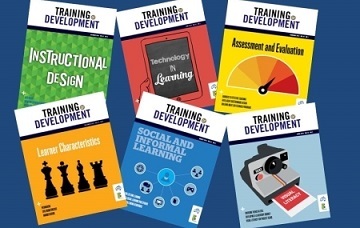 Training and Development magazine is published bi-monthly by the Australian Institute of Training and Development (AITD). It is distributed to all AITD members and NZATD members, as well as a large subscription base. If you would like to contribute an article on the themes of Coaching and Mentoring (Editorial deadline 28 August) or Leadership (Editorial deadline 23 October) contact editor@aitd.com.au. AITD may also accept previously unpublished content on any topic that may be of interest to learning and development professionals. Contributor guidelines are available at the AITD website. If you want to reach training, learning and development professionals in Australia and New Zealand phone 02 9211 9414 or email editor@aitd.com.au. Options include full-page and half-page ads or inserts. Meet some of the 2015 Australian Training Awards National Skills Week Ambassadors! The Australian Training Awards and National Skills Week are showcasing some of the best and brightest graduates of vocational education and training (VET) during National Skills Week, which will be held from 24 August to 30 August this year. Eylish Perry, Disability Support Worker, Australian Apprenticeships Ambassador and 2014 Australian School-based Apprentice of the Year, Australian Training Awards. Find out more about Eylish’s experiences with Australian School-based Apprenticeships on the Australian Apprenticeships website. Joshua Lodge, Laboratory Technician, Australian Apprenticeships Ambassador and 2014 Australian Apprentice (Trainee) of the Year, Australian Training Awards. Find out more about Joshua’s experiences with Australian Apprenticeships on the Australian Apprenticeships website. Chris Medcraft, Community Service Worker, 2014 Aboriginal and Torres Strait Islander Student of the Year Finalist, Australian Training Awards. Find out more about Chris’s experiences with the VET system on the Australian Training Awards website. • Sydney – 16 September 2015. National Skills Week aims to mobilise, inform and inspire Australians of all ages to explore the skills that Industry needs to advance Australia’s competitiveness and global opportunity. Visit the National Skills Week website for information about locations and events or to plan your own event. The theme this year is Inspiring Ideas: building a better private education and training sector through innovation, diversity and quality. Register or visit the conference website for more information. The sixth international INAP conference is being held in Australia for the first time at Federation University Australia (FedUni), Ballarat. The conference theme is Architectures for apprenticeship: Achieving economic and social goals and will address topics such as governance, school to work transition and youth employment and the status of apprenticeships as a career path. Keynote speakers include Raymond Patel, MerSETA, South Africa; Paul Comyn, International Labour Organisation, Geneva; and Stephen Billett, Griffith University, Australia. The registration fee is kept low to allow practitioners to attend. The Commonwealth Department of Education and Training is sponsoring the conference. Register for the conference and find out more on the FedUni website. The theme for this year’s conference, Reconnecting VET, will focus on three distinct streams including Policy & Reform, RTO Management & Compliance and Training and Assessing. Three additional streams dedicated to RTO Administration, VET Shapers and Trainning Packages have been added this year. Reserve the dates in your diary now and stay tuned for more information later in the year. The 2015 training providers professional development calendar is available for SA. Integrating your business and learning management systems. Service Skills Australia has released a Workforce Planning Guide for the tourism and hospitality industry. The Guide provides practical advice on “planning your business around your people” — that is, making sure you’ve got the right people and skills to meet your business goals. There is a strong relationship between effective human resource practices and a range of positive business outcomes. To start your workforce planning journey, download a copy of the Guide and utilise the workforce planning templates provided. The app can be downloaded from the Geelong Careers website, the App Store or Google Play. smallprint and Catapult eLearning’s entire training and assessment resource library is now available in print and online with a NEW assessment model. If you have any questions please contact smallprint at admin@smallprint.com.au or phone (08) 8275 9333, or Catapult eLearning at info@catapult-elearning.com or phone (08) 8275 9380. If you would like to provide feedback, supply an article for inclusion in the next edition or join our list of subscribers, please email skillsatwork@education.gov.au. The next edition will be published in September 2015. Submissions are due by Tuesday 18 August 2015.